PORTLAND, Ore. (November 12, 2012) ⎯ The November installment of BREWVANA’s monthly Connoisseur Tour series takes Sean Burke, brewer for The Commons Brewery, on the bus where he will lead the tour to his favorite Portland spots. 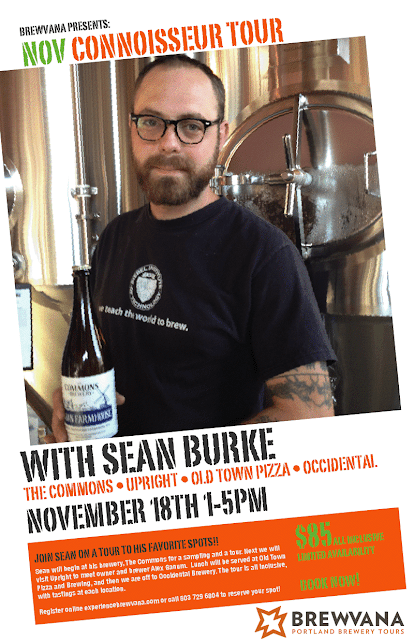 A Eugene native, Sean started as a home brewer and joined The Commons after graduation from the Doemans Academy. The tour will take place Sunday, November 18th from 1:00 – 5:00 p.m. The tour will begin at The Commons with a sampling of their European inspired beers made with Northwest grown ingredients and tour of the brewery. Next up the bus heads to Upright Brewing where owner and brewer Alex Ganum will give a tour of his facility along with a sampling of their farmhouse inspired beers made with a Pacific Northwest twist. A midafternoon lunch and beers will be served at Old Town Pizza and Brewing which launched its 7bbl brewing system earlier this year. The final stop on the tour will be Occidental Brewing Co. in the St. John’s neighborhood for a sampling of their German inspired beers. Tickets for BREWVANA’s Connoisseur Tour are $85/person and include transportation, all food and beer, pretzel necklace, tasting journal and Pilsner glass. Seating is limited and reservations must be made in advance. To register, please call BREWVANA at 503-729-6804 or visit www.experiencebrewvana.com/tours.